characters like DC's Superman, Batman and Wonder Woman, whose names and appearances were recognized by most of the general public. But within a few years, it had so many, which had become so recognizable, it was actually possible to sell a comic book that specialized in parodies of them. That comic, Not Brand Echh (originally titled without "Not" at the beginning) was launched with a cover date of August, 1967. The title was taken from a long-standing schtick in the letter columns, of referring to the competition as "Brand Echh". The comic book had a blurb at the top, reading, "Who Says a Comic Book Has to Be Good?" Underneath it was the logo "Not Brand Echh", with the word "not" smaller than the other two. It was with the fifth issue that they decided "Not" was part of the title and not the blurb. Obviously, Mad magazine, which also started out parodying other comic books, was a prime inspiration for Not Brand Echh. So it wasn't surprising that the first issue included art by John Severin (who had drawn a story in the first issue of Mad) and his sister Marie (who, as colorist to the old EC Comics line, also worked on the early Mad). Other writers and artists in the first issue included Roy Thomas (The Invaders, Captain Carrot), Gary Friedrich (The Blue Beetle, Ghost Rider) and Ross Andru (Metal Men, The War That Time Forgot). Later issues were by other Marvel regulars, including Stan Lee and Jack Kirby themselves, who had created most of the characters being parodied. 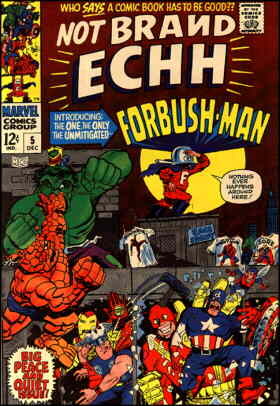 Unlike most parody publications, Not Brand Echh had continuing characters. Charlie America stood in for Captain America, The Inedible Bulk for The Incredible Hulk, Mighty Sore for The Mighty Thor, Scaredevil for Daredevil, etc. Eventually, the title fielded a resident superhero of its own, Forbush-Man (aka Irving Forbush, another letter column schtick, this one going back to 1955). The latter, in the grand tradition of superhero spoofs (e.g., Supersnipe, Captain Klutz, Super Goof), wore red long johns as a prominent element of his costume. By the ninth issue (December, 1968), it appeared Not Brand Echh had become a sales sensation — that was the first in its new format, extra-thick but costing about twice as much as most comics. But perhaps not, as the next one, billed as "The Worst of Not Brand Echh", consisted entirely of reprints from early issues. After #13 (May, 1969), it was canceled. Marvel tried parody again in the early 1970s, with Spoof. Also in the early '70s, it did Crazy, which revived a 1950s title and consisted of Not Brand Echh reprints. From 1988-93, it published What th—? !, which revived The Echhs-Men (X-Men), Agent of S.H.E.E.S.H. (S.H.I.E.L.D.) and other Not Brand Echh characters. Apparently, the concept of Not Brand Echh is seen by Marvel as a viable one, at least sporadically, even tho the title is long gone. Text ©2004 Donald D. Markstein. Art © Marvel Comics.